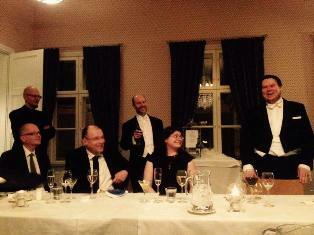 The last couple of months have been rather hectic – but very enjoyable at the same time! I wanted to share some of the things I’ve been involved in, especially as I have some good links to associated resources to share too, that may be useful to colleagues and students. The timing of this event was perfect, as I managed to also pay a quick visit to Blackwell’s at Oxford and see the recently discovered map of Middle-earth, formerly in the possession of the late Pauline Baynes (who illustrated a number of works by Tolkien and C.S. Lewis), and heavily annotated by Tolkien. 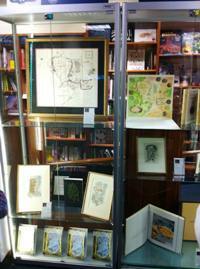 It was also lovely to see a number of original drawings by Pauline Baynes from Leaf by Niggle, Smith of Wootton Major, and the Narnia books. In early November I travelled to Oulu, Finland, to serve as the ‘opponent’ (in UK academic terminology, an ‘external examiner’) of the first ever PhD thesis on Tolkien’s literature in Finland. 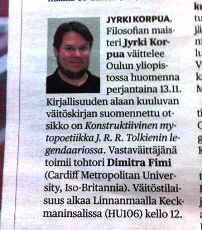 The candidate was Jyrki Korpua, and his thesis – supervised by Dr Pekka Kuusisto – was titled “Constructive Mythopoetics in J. R. R. Tolkien’s Legendarium“. As per the Finnish system, the thesis was published prior to its public defense and is available to download and read here. Jyrki’s doctoral dissertation offers some new, exciting insights into the philosophical and aesthetic underpinnings of Tolkien’s legendarium. The public defense was a great occasion, in which Jyrki and I engaged in rigorous academic debate about Tolkien’s work and Jyrki’s findings and arguments for a good 2 hours and a bit, chaired by Professor Kuisma Korhonen (the ‘Kustos’, in terms of ceremonial terminology). I really enjoyed the outward-facing, public nature of this viva (as opposed to vivas in the UK or the US which are much more private affairs). I think there is a great value in opening cutting-edge research to the wider public and sharing and disseminating research findings in this way. The defense was followed by the Karonkka, a traditional celebration of the candidate’s achievement but also an occasion to thank all the people that supported him/her academically and personally. Jyrki’s Karonkka was a very memorable occasion, with lovely food, great company and some surprises too (including singing and some excellent speeches). 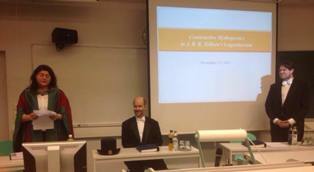 The day before the defense, I was also delighted to give a public lecture at the University of Oulu. 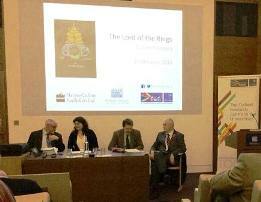 The title of my lecture was: “Dreaming the Middle Ages: The Past as an Imaginary World in the Works of Thomas Chatterton, J. R. R. Tolkien and Umberto Eco”. The students and colleagues at the University of Oulu were very welcoming – I really felt like a part of this excellent academic community during this lovely trip to Finland. 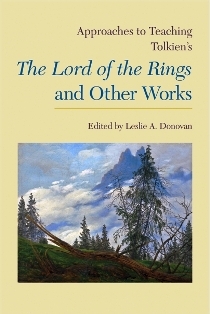 The long-awaited MLA volume on Approaches to Teaching Tolkien’s The Lord of the Rings and Other Works is now officially out! Editor Leslie A. Donovan did a brilliant job putting together excellent resources and papers on teaching Tolkien in university courses. Janet Brennan Croft‘s endorsement says it all: “This work fills a major need. It will give graduate students and experienced professors alike the confidence to teach Tolkien and the ability to construct a meaningful and challenging course.” My paper is titled “Teaching Tolkien and Race: An Inconvenient Combination?”. For more information on this edited collection, including the full table of contents, see here. Leslie has also recently launched Waymeet for Tolkien Teachers, a digital journal for teaching J. R. R. Tolkien’s works and life in post-secondary schools. On the 150th anniversary of the publication of Alice’s Adventures in Wonderland, a celebration of Alice in sound and vision, on stage and screen and through apps and archives.